:Some say the great mystery of how one can live in two worlds at once died with Thomas Hunter many years ago. Still others that the gateway to that greater reality was and is only the stuff of dreams. They are all wrong. Rachelle Matthews, who grew up in the small town of Eden, Utah, discovered just how wrong when she dreamed and awoke in another world. There she learned that she was the 49th Mystic, the prophesied one, tasked with finding five ancient seals before powerful enemies destroy her. If Rachelle succeeds in her quest, peace will reign. If she fails, the world will forever be locked in darkness. In The 49th Mystic, Rachelle found the first three of those five seals through great peril and mind-altering adventure. But two seals remain hidden and the fate of both worlds hangs in their balance. As Rachelle Matthews sits deep in a dungeon, Vlad Smith is just getting started. Thomas Hunter's world is about to be turned inside out. The mystics say that there is no defense against the Fifth Seal--but finding it will cost Rachelle everything. So begins the final volume of high stakes in one girl's quest to find an ancient path that will save humanity. The clock is ticking; the end rushes forward. About "Rise of the Mystics (#02 in Beyond The Circle Series)"
Ted Dekker is known for novels that combine adrenaline-laced stories with unexpected plot twists, unforgettable characters, and incredible confrontations between good and evil. The son of missionaries, he grew up in the jungles of Indonesia. He returned to the United States to attend Evangel College, graduating with a religion & philosophy major. After several years in corporate marketing, in 1997 he began writing books like Heaven's Wager now he has written numerous books including bestsellers Skin, In the Blink of an Eye, Saint and Thr3e. Ted lives in Nashville, TN with his wife LeeAnn, and has four grown children. 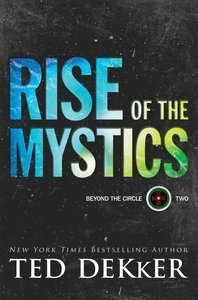 Customer Reviews For "Rise of the Mystics (#02 in Beyond The Circle Series)"
This is a brilliant follow-up to the 49th Mystic, and has even more surprises and deep truths to contemplate along with the 49th as she continues her journey. Absolutely superb book. Great reading - I highly recommend these books. "Ted Dekker is a master of suspense."